Takis since 2011, is a co founder of First Athens Corporate Finance, a boutique Investment Banking and Venture Capital management Firm. First Athens manages Elikonos Jeremie SCA SICAR a Euro 17 million ICT fund investing in Greece. Takis has significant investment experience (7 years with Global Finance and Vectis Capital) in start ups, mature businesses and LBO deals in Greece, the Balkans and West Africa. 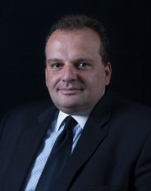 He has gained significant operating experience from his tenure as a General Manager of a major Logistics Business (turnover in excess of � 250 million) and as COO of a major Media Group with operations in Greece and the Balkan region. Started career in the UK with Arthur Andersen (audit & corporate finance). In 2009 he co-founded First Athens Corporate Finance an independent boutique corporate finance firm. Studied in the UK, holds a MBA from Sheffield business school.